One of the best ways to learn digital photography is to look at photographs. Study the photographs of the acknowledged masters in your genre of photography. 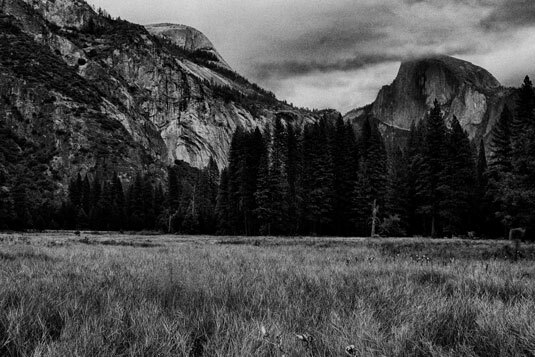 If you love landscape photography, study the work of Ansel Adams, David Muench, and Clyde Butcher. Galen Rowell has also made a mark in nature photography. When you’re learning your chops, look at as many photographs as you can. You can find the work of your favorite photographers by entering their names in your favorite search engine. If you want to convert lots of your color images to black and white, for example, you might look through books of Ansel Adams photography to get an idea of how he’d handle photography in the digital age. After experimenting with photos, perhaps you come to this conclusion: He’d embrace it and use his famous Zone System in conjunction with a program like Lightroom with the Nik Silver Efex Pro 2 plug-in. But Silver Efex Pro 2 does more than just convert images to black and white. You can emulate film grain from popular black-and-white films such as Kodak Plus-X and Tri-X, and many more. The figure shows a photograph converted to black and white with Silver Efex Pro 2. When you study the work of a master, you see a pattern. His most famous photographs have a distinct style. If you’ve photographed any of the same places, compare your work to his. You’ll probably see differences in the way the photo was composed, the vantage point he used, and perhaps the choice of focal lengths. If your favorite photographer gained lots of notoriety, you may be able to find recorded interviews that give you an idea of how she captured her greatest images. YouTube is a great place to look for interviews and information about famous photographers.